This switch is on the price list which means it is actually orderable. A slide deck from a June 2018 talk at CiscoLive! in Orlando explains the role of merchant silicon in the Nexus product line. There are Nexus 3132 variants based on Trident-2, Trident-2+ and now Trident-3. There is also a product that contains the Tofino switch ASIC. Thanks to Timothy Prickett Morgan for writing an article reviewing the slide deck. Timothy point out that there are internal details of the Trident3 ASIC disclosed for the first time in the deck. 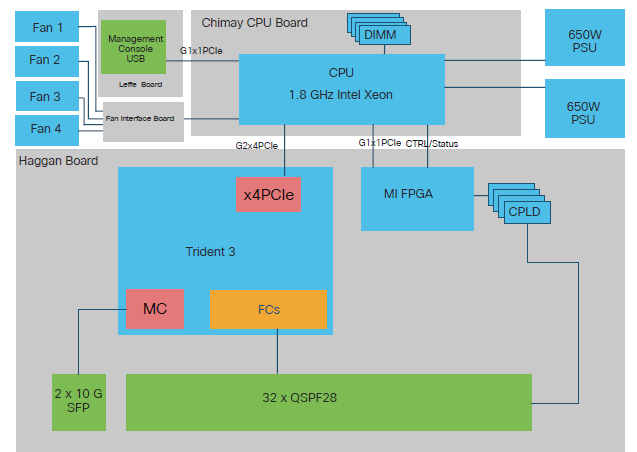 The CPLD (Complex Programmable Logic Devices) and the FPGA may be secret sauce that customizes the switch to Cisco.